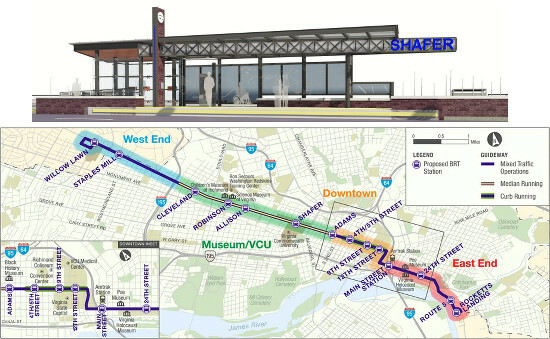 The latest map of the Broad Street BRT from GRTC. The initial feedback from the community about parking was taken into consideration. The initial plan called for the loss of 708 parking spaces, and alternatives presented in the update meeting indicate that there has been a 60% reduction in the number of spaces to be removed on Broad Street. A study is currently underway that will determine the best way for the existing fixed-route bus service to interface with the BRT. Henrico County is open to extending the service to Short Pump, however they are not committing to anything at the moment. It seems as if they are taking a wait-and-see approach toward the existing plan. GRTC is working with Richmond City and VCU as they consider how to implement the BRT in a way that meets pedestrian and cyclist needs. They are still gathering feedback from the community and technical advisors, and North-South access across Broad Street is still being refined. The next round of meetings will be held in July. On April 18, 2015 RVA Rapid Transit will lead an effort to canvass the Broad Street Corridor. We hope to engage citizens and merchants in conversation about the benefits and their concerns related to Bus Rapid Transit. Volunteers will distribute information, collect feedback and contact information so we can keep citizens and business owners engaged, updated and informed of the process. Who: RVA Rapid Transit supporters, transit advocates, enthusiasts and anyone interested. What: Help canvass the Broad Street corridor to spark positive dialogue around the BRT, collect contact information and explore citizen concerns. When: Saturday, April 18, 2015, 12-4 p.m.
Where: We will gather at St. James Episcopal Church @ 1133 W. Franklin for orientation. Parking is available in the lot beside the building and in the parking garage across the street. After orientation we will disperse to areas around the proposed BRT stations along Broad Street. We have free Go Cards for the first 50 volunteers to arrive, but please bring $3 for the bus just in case. The bus is $1.5 each way and you will need exact change. How: Sign up HERE. Email ebony@rvarapidtransit.org for more information. Please invite anyone you know who might be interested and we encourage student, civic and church groups to take this on together as a service project. GRTC releases some more details of the future BRT system. The first of two meetings to show off and discuss the rapid transit plan occurred last night. As expected there were some changes to the original plan and quite a few details were released. Busses would operate every 10 minutes during peak hours and 15 during off peak and cost $1.50. More information at Style Weekly and Richmond Times Dispatch. Wednesday September 17, 2014 from 6:30pm to 8:00pm. The Science Museum of Richmond 2500 West Broad Street Thalhimer Theater Richmond, VA 23220 Seating is limited so please RSVP to let us know you are coming. Joe Calabrese** led Cleveland’s effort to build the innovative 6.8-mile long Healthline, a Bus Rapid Transit (BRT) system connecting several of the city’s major employment hubs, including a major university health system. Since Cleveland’s BRT came on line in 2008, the corridor has seen over 5.8 billion dollars in economic development. The Healthline corridor has many similarities to Richmond and is being used to predict economic development, especially as it relates to job access, for the planned BRT route. Come hear Mr. Calabrese’s exciting vision about how Bus Rapid Transit will move Metropolitan Richmond into the future. Recently, RVA Rapid Transit reported on the Government Accountability Office (GAO) report on the effects of Bus Rapid Transit. We would like to summarize this fifty four page report for those who do not have the time to read the entire report. The 2012 report, surveyed 20 BRT projects nationwide. The GAO also did five site visits to BRT projects to gain more insight on particular characteristics of the projects. These 20 BRT projects were compared to 20 railway projects to determine differences in ridership ( GAO, 2). Overall, after one year of service, BRT has resulted in an increase in ridership for 13 of 15 projects that reported ridership information. This translates into an average travel savings times of 10 to 35 percent. Overall, U.S BRT projects have lower ridership than international BRT systems, such as those in South America. The report’s authors explain this difference because U.S BRT systems generally have lower population densities and U.S riders generally have a more positive view of rail systems than bus systems ( GAO, introduction). However, the study found that success of rail over BRT was not so much an issue of the inherent superiority or inferiority of one system over the other, for each type of transportation has benefits and drawbacks. Instead the study found that marketing, perception, infrastructure development, and Transit Oriented Development (TOD) all contribute to the success of a transit system. Cleveland Ohio, for example, helped spur economic development by investing in dedicated lanes for the BRT vehicles, which is one way for transportation planners to signal the community’s commitment to the corridor. The study found that the majority of the BRT projects surveyed ( 16 of the 20) operated in mixed traffic for 50% or more of their route ( GAO, 10). Only 5 of the 20 BRT routes surveyed traveled along a dedicated or semi-dedicated guide way for 30% or more of their routes ( GAO, 10). According to a recent Broad Street BRT update presented at April 22nd’s Richmond City Council Land Use, Housing and Transportation committee, the current Broad Street BRT plan would call for 50% dedicated guide ways putting the project in the top of the pack as far as BRT in the United States is concerned. The GAO study found that this sense of permanence from infrastructure development was reflected in land values around BRT corridors. For example, “the University Circle portion of the Healthline, which received significant infrastructure and private institutional investments (i.e., investments that are more likely to be perceived as permanent by developers and others),experienced modest to large increases in land values.” ( GAO, 34). This particular area of the Cleveland Healthline had an average increase in property values in $10 per square foot, an increase of 30% three years after the Healthline opened ( GAO, pg 40). The Cleveland Healthline, because it is so similar to the Rocketts Landing to Willow Lawn, was used by GRTC and the Virginia Department of Rail and Public Transit to predict the potential economic development of the Broad Street BRT. According to the most recent Broad Street BRT update the Broad Street BRT could result in $1.5 million dollars in economic impact each year, a $1.1 billion increase in property values over 20 years, and a $98.3 million increase in real estate tax revenue over a 20 year period. The GAO is a well respected, nonpartisan, government agency who’s report shows the promise of Bus Rapid Transit as well as the downsides and areas for growth in this emerging form of Mass Transit in the United States. We at RVA Rapid Transit encourage you all to read the full report and decide for yourself if Bus Rapid Transit is right for Metro Richmond. Ready to Ride T-shirts are Here! Show your support of RVA Rapid Transit by sporting one of these Ready to Ride T-shirts. All proceeds from the sale of the shirts, will go toward funding the production of more RVA Rapid Transit collateral for future events. Get your shirt here, today. Lookin' good!